This guy will bend over backwords to get "The Job" done for you. oooo. i hope he doesn't burn his little toes! hilarious and wonderful!!! great work Josh! Ouch, this guy makes me hurt :0 Very clever and a good ad. You used a live model for this one, right? Perfect illo! Original!! this is like yoga! We have a guy like that at work. He makes the rest of us look bad. :) Great concept! That does it, my New Years resolution for 2008: Take up yoga! 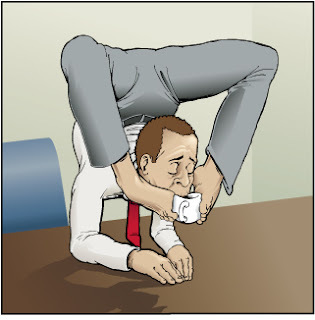 Perhaps that's been holding me back in the corporate world, lack of flexibility! So realistic! Its really great. You're reminding me I need to get back into yoga. I would love to be able to do this pose(sans a hot mug). Oh this is a good one! I think he would be an excellent employee for multi-tasking. Great job! This is great. I feel that way at work sometimes! But I am not so flexible. i hope you don't mind, but i've tagged you to list your top 25 films of all time! when i was a kid i used to eat my cookies using my feets too!! ha ha this is truly amazing, the illo and the very idea.